Heesen Yachts announce the launch of their latest yacht in the 50m all-aluminium series introduced in 2011 with the World Superyacht Award winner Satori. This new sistership, sold by the yard at the end of 2011, is called Ventura (hull 16050). Like her previous sisters, the 49.8m superyacht Ventura has naval architecture by Heesen in collaboration with Van Oossanen, and her clear lines were designed by Omega Architects. Her colour scheme, a dark metallic grey for the hull and a light metallic grey for the superstructure, differs from her sisters and make her elegant and easily distinguishable. The minimalist interior, designed by Francesco Paszkowski, differs from her sisters. In this very chic environment, special attention was given to the ambient lighting to create a relaxed atmosphere and highlight the owner's art collection. She accommodates 12 guests in six cabins including two master suites on board, one aft on the bridge and one forward on the main deck. The remaining accommodation comprises a full-beam VIP and two doubles and a twin cabin. Note also the presence of another twin cabin for staff. This efficient semi-displacement yacht is powered by twin 2,720kW MTU engines giving a top speed of 22.5 knots and a range of 3,200 nautical miles at 11 knots. Ventura will be delivered to her owners following her current sea trials. 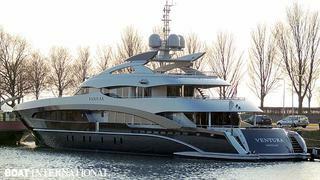 Note also that Heesen has recently launched their new flagship, the 65m Omnia. We'll publish more details about this project very soon.